If you are in a hotel business looking to have a unique and elegantly designed booking form for your hotel website, then we have a perfect solution to boost your business profits and expand your business farther than you think by using this fabulous and magnificent room booking form for your hotel website. This magnificent booking form is also a perfect choice for all your hotel related websites like resorts, villas, hostels, motels, Service Apartments, Vacation Rentals, guest houses and much more. 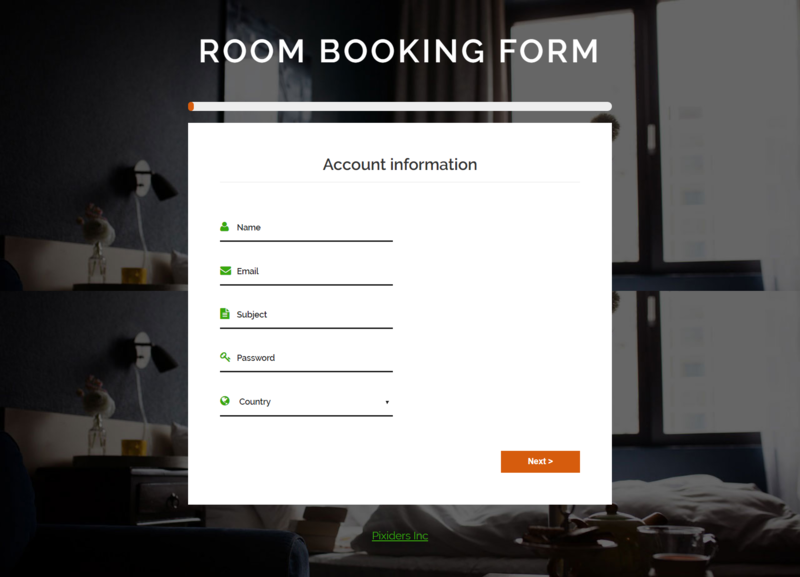 This elegant room booking form has pretty awesome features like, if you fill in the details of first form that is account information and click next, and then it automatically goes to next form in the same page, same section and same content. But you can watch the progress bar above the form which slides to right whenever you successfully complete the filling the form details which gives a unique eye catching look to this fabulous room booking form. This elegantly designed room booking form is 100% responsive cross browser form, compatible on all devices, displayed on all screen sizes. It is entirely built in HTML5, CSS3 and JQuery. Make it yours now by using it, downloading it and please share it.